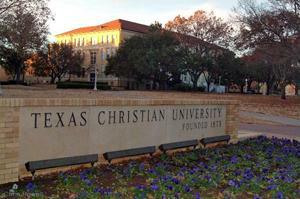 Texas Christian University Chancellor Victor Boschini says his school will not tolerate drug dealers on his campus. KERA’s Bill Zeeble reports police arrested 17 students accused of dealing illegal drugs at the Fort Worth school. The bomb shell hit Wednesday morning, with the announcement of the arrests, including 4 members of TCU’s championship-caliber football team. Victor Boschini, TCU’s Chancellor since 2003, said the focus here should not be on the sports players per se, but on all the alleged drug dealers. Boschini: This is a student issue and not a sport issue. We have over 500 student athletes. And four of them were arrested. I think it’s a student issue and a societal issue. Boschini said most students are good kids who do the right thing. In fact, he said student complaints about drug dealers prompted the 6-month undercover investigation, targeting serious perpetrators. Boschini: None of these people are being charged with using. These are all being charged with selling. I think that’s a step above even using and I think using is bad too, I’m not condoning using. But I’m saying these weren’t users, these were dealers. If proven guilty, Boschini said all the students will be officially expelled. He said they’ve already been removed from TCU’s campus. He said he’s open to forgiving those who repent, but with limits. Boschini: God bless you, I forgive, I hold no hate against you, and I hope you get healthy again and straighten out your life. But you need to do that somewhere else. Police continue their investigation and say more arrests are possible. In fact, the Star-Telegram reported two arrests were made last week, separate from the 17 on Wednesday.